After 16 months, I am proud to have finally achieved an approval of reserved matters on behalf of my Clients for a site of two new dwellings in Cotton. The design is for two bespoke properties, each boasting a large open plan kitchen/living/dining space and 4 bedrooms. Works are near completion on a two storey extension in Claydon, Suffolk. The project involved major updates to the layout of the old semi-detached property. The Client purchased the property as a three bedroom home; however two of the bedrooms were very small. The only toilet was downstairs in a lean-to extension to the rear and the kitchen was a very poor size. The new layout includes three double bedrooms, with an en-suite to the master bedroom. The downstairs bathroom has been removed, relocating the downstairs toilet into a new front porch. This opens up the downstairs space to form an open plan kitchen/diner with bi-folding doors into the rear garden. The Client is extremely happy and looks forward to finishing the build. Works have commenced on a new side extension I have been working on in Denham. The footings have been inspected by building control who are happy with progress. The digger is shown here, struggling with the clay! I am proud to announce that planning permission has just been granted for my design of a proposed front extension to a barn-style dwelling in Mellis. The extension will form additional kitchen and bedroom/en-suite space, providing the Clients with much needed space for their daughter. Works are progressing well on Phase 1 of the 9 house development at Benhall, with the footings for Plot 1 being well established and Plots 2-5 also out of the ground. Works are progressing well on the front extension at Henley Road. The bricklayers have done a very nice job of matching up the existing Flemish bond brickwork with the adjacent garage and formed a beautiful curve with header bricks. The extension appears seamless against the rest of the house. The windows are to be designed with the frames hidden within the brickwork to allow for as much light as possible to enter the room and will be specially made to fit the curve of the extension. A flat roof will be hidden beyond the parapet wall to blend in seamlessly with the roof of the existing garage. Works are progressing on a new dwelling in Kettleburgh, for which I am Contract Manager and Principal Designer. The foundations and plinth bricks below DPC level are in place and the site is looking good so far! 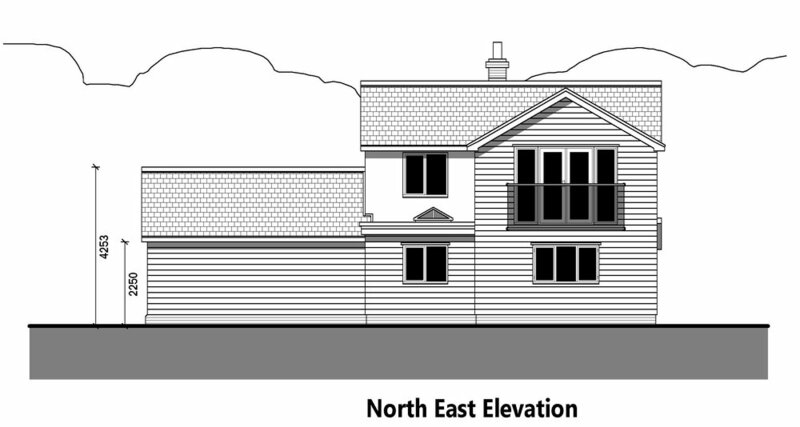 Planning permission has recently been obtained for the proposed two storey rear extension and side extension to a house in Thorndon. The Clients are very pleased with the outcome and look forward to Let's Design Architecture completing the building regulations drawings in the near future. Works recently completed on a conversion project in Saxmundham. The existing townhouse was converted into two separate dwellings, including the re-building of a previously demolished lean-to. The original property would have been two town houses, which had previously been converted into a single dwelling; the layout of which didn't work and the appearance was outdated. The original sash window had been removed and replaced with a poor quality casement window, which looked out of place on the street scene. The property lends itself well to being two dwellings as it was formerly, so the developer wanted to restore it as such. Works to the frontage included the provision of a new front door and window, re-instating the original appearance, along with carefully chosen brickwork to suit. A new party wall was added to separate the dwellings and the internal layouts were carefully designed to maximize space. The developer is very happy with the finished houses. The Government has recently introduced a new fee scale for Planning Applications, increasing the fees by 20%. These new regulations also include the right for them to charge a fee for applications for planning permission related to the removal of permitted development rights through Article 4 directions or by condition, where this was previously free of charge. The Planning Portal fee calculator provides the latest fees for planning applications. Contact Zoe at Let's Design Architecture if you need drawings and to make an application for planning or building regulations. Today I am in London, which is always architecturally interesting. I have just driven here on a day trip to the Royal London Hospital. I didn’t know what to expect, I have been to a few hospitals around London with my parents and usually they are a mismatch of architectural styles, using converted buildings with new elements added on. I was quite impressed to find a completely contemporary building with a very smart blue mosaic facade and modern glass atrium. I only went to the second floor, but from here you can see that the hospital architects have made the most of the views of London and the famous ‘guerkin’ at 30 St Mary Axe. The interior is very clean, open and well thought out. I should really have ventured to the top floor to get the most of the view, but I didn’t think about it at the time. Maybe if I come back I will get a picture from the top! After a lengthy planning process, Let's Design Architecture has recently obtained planning permission for the change of use conversion of a barn to form a holiday let. The barn had previously been used as a shop, although is now redundant storage space. The planning process took some time as we had to prove the viability of the potential use as well as giving reasons why there is no longer a requirement for a shop in this area. 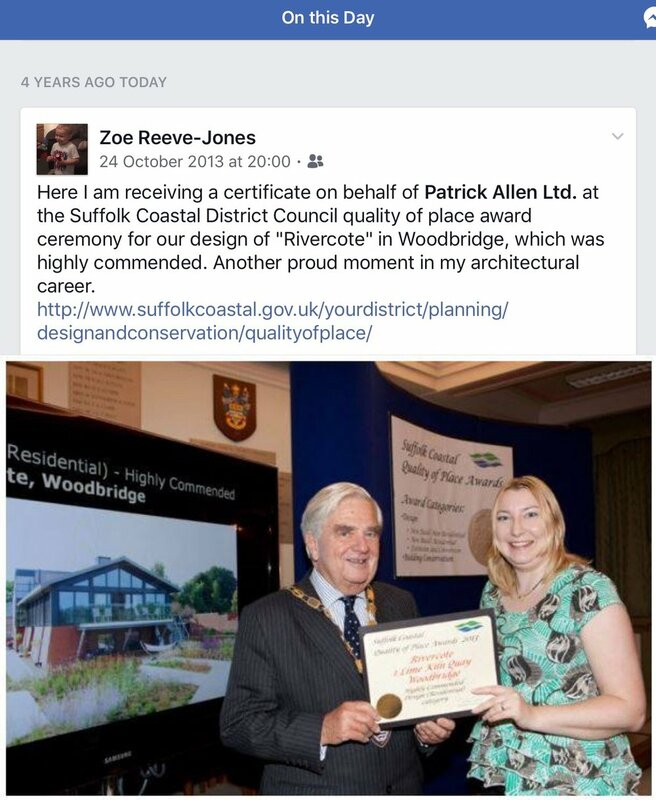 Following on from my previous blog about my architectural career, this just popped up on my Facebook timeline - a proud moment four years ago, I was part of the design team on the locally famous Rivercote dwelling, near the River Deben in Woodbridge. We won Highly Commended for Design (Residential). I worked on the initial design concept alongside Patrick Allen and produced detailed coloured planning drawings and site plans. The dwelling is built on a flood plain, with the residential area being located on the first floor allowing for the storage area underneath to become flooded while not affecting the living area above. Growing up, I didn’t know what I wanted to become. Its difficult when you are young to find a place in the world. People say ‘the world is your oyster’, which is true to a certain degree, but I was constrained within an educational system which gave me no idea about the real world and what was out there career wise. I knew what my strengths were and I knew what subjects I wanted to study at sixth form. I didn’t know where that would lead. Not a clue. By the age of seventeen or eighteen, other people seemed to have an idea, they knew where they wanted to be in five years time. I really didn’t and the thought of being lost in the real world terrified me. Most people don’t believe me when they ask me ‘why did you want to become an architect?’ and I tell them that I opened the big A-Z careers book in the library at sixth form and starting at ‘A’, the word ‘architect’ popped out. If I had opened a different page who knows what I might have become! Art and history were my subjects, I loved graphic design and when I saw the job description, that was it, my mind was made up. When my mind is made up about something, I go for it. So that’s what actually happened. I went on to study architecture and I’ve never looked back. I have been lucky in my career choice. I landed a summer job in my third year at university with Patrick Allen. Patrick’s practise was small, he had employed Paul a few years earlier and it was just us for a while, with Mary there to look after us all with regular tea and cakes! I was lucky enough to carry on working while studying part time and I realise that I was truly blessed to have the support of the company during my studies. I had such a good job I worked there for thirteen years. I then took a leap of faith, became self-employed and have not looked back. I really love my job. Sometimes it is really hard work, juggling everything, meeting clients, preparing quotes and invoices, carrying out measured surveys and working up drawings without a team of colleagues to bounce ideas off. However, it is so much more rewarding when you know you have made a difference in someone’s life. Making someone’s home better. Building someone’s dream. I drive around a lot and I visited some potential clients this evening. The sun was setting and a beautiful orange colour enveloped the autumnal countryside. I loved the journey and I loved meeting the people. They had phoned around other architects and they were impressed with me, because I gave them time and listened to their ideas. I want to make their house better, to make a difference in their lives. This is what I want to continue to do, every day. I didn’t find architecture. Architecture found me, and I’m thankful that it did. I found my place in the world and have the confidence to justify my career choice and be proud of what I’m doing, even if I did just pick it out of the first page of a book. Wow, just wow. I been playing on the PlayStation VR and it is incredible. Growing up in the 80’s and 90’s, virtual reality was a dream. We never really believed that it would become a reality, much like hover boards and robots that talk and think like people. But these things are becoming reality. I am blown away by VR. It was the first time I had tried it, I recommend that everyone gives it a go. You can go deep sea diving with a shark, go on a rollercoaster and go into outer space, all in your living room. It is so unbelievably lifelike. You enter into a room and look up and you can see a vaulted ceiling with mouldings and detailed 3D statues in the walls. You look down at a very realistic tiled floor. All around you is a new room you have never entered before and it’s so real that your mind is tricked into believing that these things are there and can be touched. Which brings us to the future of architectural design. One day soon we are going to imagine our dream house and be able to take a tour of it before it is built. We could check what furniture would look good, we could wake up in the morning looking at the view from the window and adjust the position of the rooms according to the sun. Would we even have to build it at all? Would it be possible to actually live in a virtual world? I’ve been a very busy bee today working up some building regulations drawings for an extension and alterations project in Ipswich. Getting there on this one, loads more to do this week though! 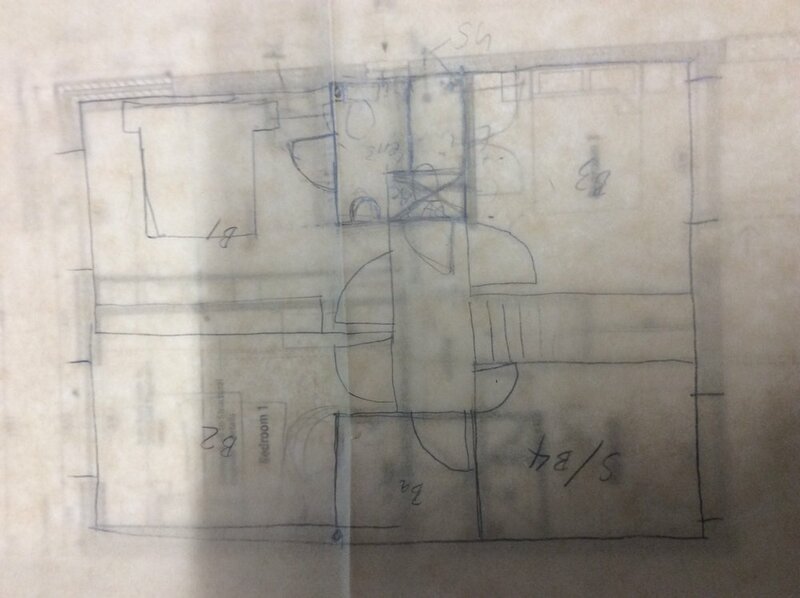 So today I am working up a new first floor layout for an extension project I am working on. I needed to do some sketches on site. Who knew baking paper could be so versatile! My Client has recently gone out to tender on his project in Stowmarket, which involves a living room extension, conservatory and first floor extension. For this project I have obtained planning permission and building regulations approval, as well as having been appointed Principal Designer for the design stage and completing the preparation of tender documentation. I have recently issued the invitation to tender to competing building contractors on the Client's behalf. This involved putting together a full tender package for the building firms to work from, including details of the planning permission, building regulations drawings, Principal Designer information and Structural Engineer's details. The Client is hoping to make a start on the project in February 2018 and we aim to receive the quotations back mid-October. Having had feedback from one of the Main Contractors to whom I issued a tender invitation, he thought that my tender package was very thorough and was impressed with the level of information provided. This is the first project which I have completed as Let's Design Architecture through from design stage to tender submission, since becoming self-employed. I hope it is the first of many!